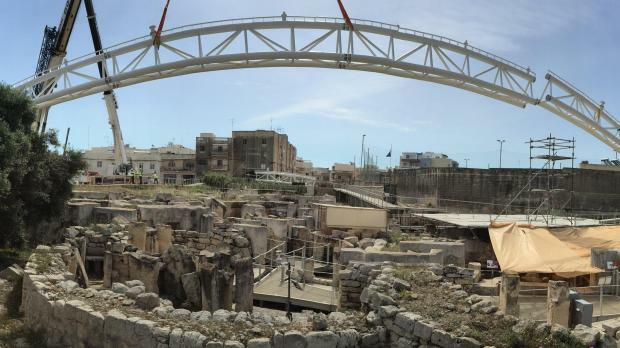 The first of two arches that will support a shelter over Tarxien prehistoric temples has been erected. Heritage Malta said the shelter, consisting of a metal frame with a specialised fabric stretched over it, will protect the temple remains from the sun and rain, effectively breaking the heating/cooling, wetting/drying cycles which harm the soft globigerina limestone. This will ensure long-term effective protection from the major causes of deterioration. The protective shelter is the last of a long list of activities on this site which included conservation-related studies, three-dimensional documentation, archaeological excavations as well as the building of a new and extended walkway which is fully accessible. The works were carried out as part of the Archaeological Heritage Conservation Project, partly funded through European Regional development Funds (Cohesion Policy 2007-2013), which also included major works on conservation and visitor facilities at Ġgantija and St Paul's Catacombs.